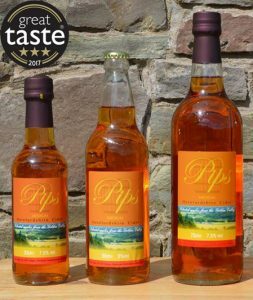 Pips Cider is delighted to announce that it is the only business in the county of Herefordshire to be awarded a three star award in the 2017 Great Taste Awards by the Guild of Fine Foods. Premium cider paired with foods is an adventure which more and more people want to experience, and since its humble beginnings in 2010, Pips Cider has worked hard to promote the benefits of enjoying food with good quality cider. Already Protected Geographical Indication (PGI) accredited, Pips Herefordshire Cider has already won a number of awards in recent years. 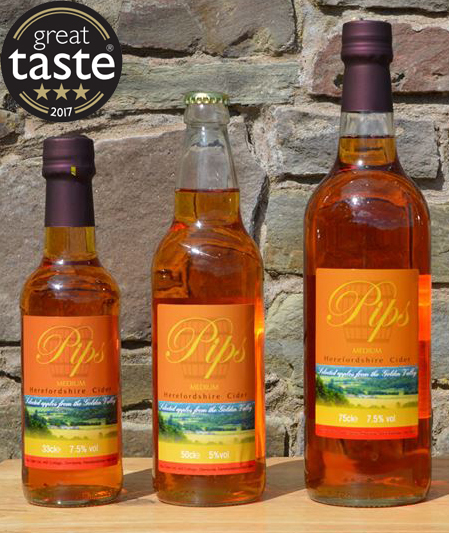 “Achieving a 3 star Great Taste award is a massive boost to our business and an acknowledgement that we are on the right track”, said 32 year old Alistair Phillips who makes Pips Cider at the family home in Herefordshire. “We always knew that there was a place in the market for our unique cider. We have been working really hard to develop a product which could build on the heritage of our 58 year old apple orchard. We wanted a product which could be enjoyed by itself or, when combined with certain food, added something special to the flavour”, he adds. Achieving a 3 star Great Taste award in 2017 means that producers represent only 167 out of more than 12,000 global entrants, and 400 judges took 3 months to evaluate all of the entries. Great Taste is widely acknowledged as the most respected food accreditation scheme for artisan and speciality food producers. “We are a small family business and winning this award is the pinnacle of our success. We are so excited about what the future holds for us, and already have lots of ideas of where we want to take the business. We can’t wait to get started,” says Alistair.